Ultherapy®, previously known as Ulthera, is an advanced ultrasound device, used to treat sagging skin of the face and neck. 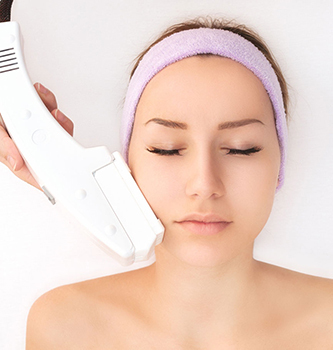 The device is non-invasive, and applies ultrasound waves to the skin to gently heat and tighten loose skin. Additionally, over a period of months, collagen will regrow beneath the skin, causing skin to look even younger over time. Ultherapy® is a revolution in facial rejuvenation. Ultherapy® uses ultrasound energy, commonly used in medical imaging and physical therapy to achieve skin tightening in an in-office treatment. Dr. Nettle conducted the first clinical trial of this new technology in Australia for lifting, tightening and toning skin without surgery. With the trial now completed, Silkwood Medical can offer a new, proven, non-surgical solution for lax facial skin. According to Dr Nettle this cutting-edge technology will make an enormous change to appearance medicine techniques. The unique combination of ultrasound imaging [allowing the practitioner to ‘see’ up to 8mm into the skin] and ultrasound energy, precisely delivers acoustic sound wave energy deep into the skin resulting in precise skin tightening. Ultherapy® uses sound waves to safely firm, tighten and actually lift skin tissue without disturbing the surface of the skin. For this reason there is little or no downtime with this treatment. How does Ultherapy® achieve skin lifting? When the deeper collagen support weakens, the skin is prone to gravitational forces and begins to stretch, sag and shift downward descending and deflating. The skin gradually becomes loose and lax. Ultherapy delivers energy to the deep skin tissue leading to a healing response which causes tightening and lifting. What areas can Ultherapy® help? The forehead – for brow droop. The cheeks – to combat flattening of the mid-cheek. Nasolabial folds – “Marionette” lines on chin, downturned mouth. The neck – Loss of jawline definition, jowls. What should I expect from the Ultherapy® procedure? When the deeper collagen support weakens, the skin is prone to gravitational forces and begins to stretch, sag and shift downward descending and deflating. The skin gradually becomes loose and lax. Ultherapy delivers energy to the deep skin tissue leading to a healing response which causes tightening and lifting. Ultherapy® is usually a single treatment, although treatments can be repeated if needed. Ulthera’s technology was originally developed for tumour ablation in liver cancer patients in collaboration with Johnson & Johnson. As an unexpected side effect a tissue tightening effect was noticed. Treatments require no preparation, are generally well tolerated and require little or no recovery time.